People in Calgary engaged in social justice and environmental activism. We initially connected through Adbusters magazine. 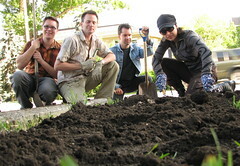 The Calgary Culture-Jammers are preparing for another adventerous season of guerrilla gardening. We welcome people dedicated to organic gardening—particularly food crops—who are eager to join us in our efforts to transform the urban landscape. Our planning meeting is this Thursday, March 29, 6:30-8:00PM, at the Arusha Centre (106, 223 - 12 Avenue SW). We went out around downtown Calgary this afternoon, ticketing SUVs (and limos) for their high inefficiency—with additional penalties for idling vehicles. We used the tickets (“Citizen’s Statement of Offense”) that the Montréal arts collective ATSA gave us last month when they were presenting in Calgary. Some folks from CBC television’s The National news program came along, with their reporter Mark Kelley joining us in ticketing vehicles. They’re filming a documentary on Hummers to air on The National—probably in March. We're heading out on Saturday to ticket some of the least efficient, most polluting, vehicles on the road. Join us at noon on Saturday, February 17, at the Haymarket Café. From there we'll head out together to a shopping mall parking lot. Buy Nothing Christmas has posted lyrics for a whole bunch of anti-consumption christmas carols. June the 4th is our second annual organic art action! Meet at Eau Claire Plaza at 1PM, and hope for good weather! The idea is to create collaborative artwork in a public space by using all-natural found materials. The works will be completely non-damaging to the environment and temporary in nature. A well-known artist working in this fashion is Andy Goldsworthy. Photos from last year's event are here. We'll be gathering to engage in some guerrilla gardening. Please wear clothes suitable for gardening - such as overalls and gloves. Bring any garden tools you can, especially hand trowels (hand shovels) and hand forks/rakes. Please bring some stones for the border decoration, too - if you can (between 1-5 inches in diameter). There are Adbusters Jammergroups (email lists) in many communities around the world. We're signed on with the one in Calgary. See our Calgary Culture-Jammers Meetup Group for a calendar of our upcoming events and meets. For calendars of events and more info, please see the local Activist Network.